This table is a tribute to the fallen heroes of the Alamo who bravely stood their ground under siege by an overwhelming force in a pivotal battle for Texas independence. 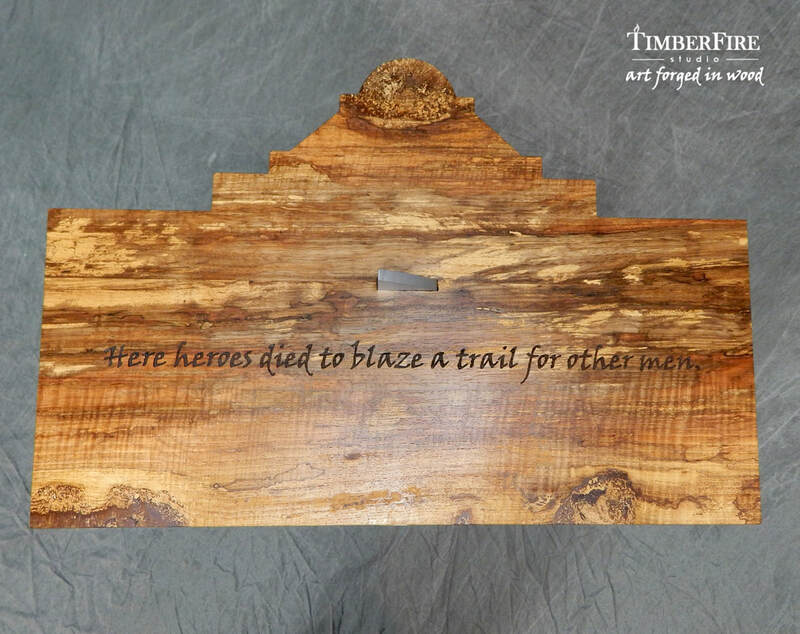 Their sacrifice provided General Sam Houston with the time he needed to prepare for ultimate victory at the Battle of San Jacinto. 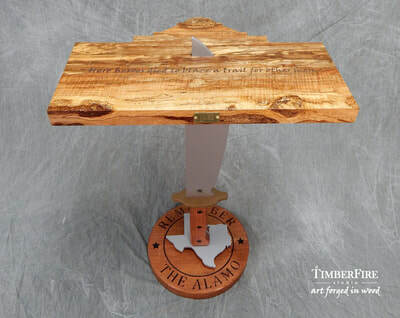 The table top is a rare specimen of Texas Spalted Curly Pecan crafted into the shape of the Alamo. The inscription is taken from a sign that graces the front door of the San Antonio shrine. 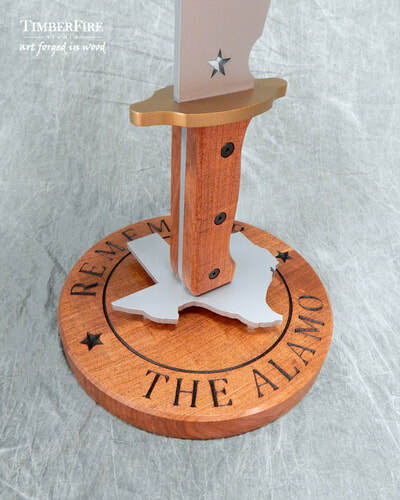 A solid brass plate is hand punched to commemorate the year of the battle and Texas Independence. 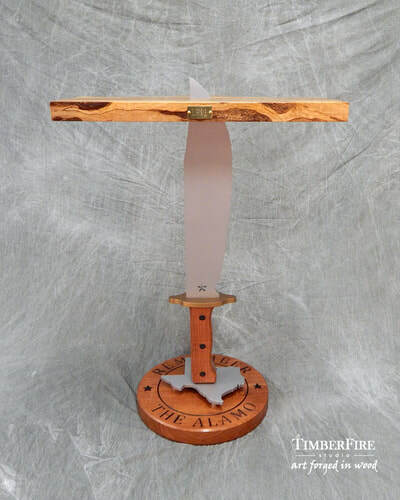 The blade is an oversized version of the iconic fighting knife made famous by Colonel James Bowie who commanded the defenders along with Colonel William Travis. 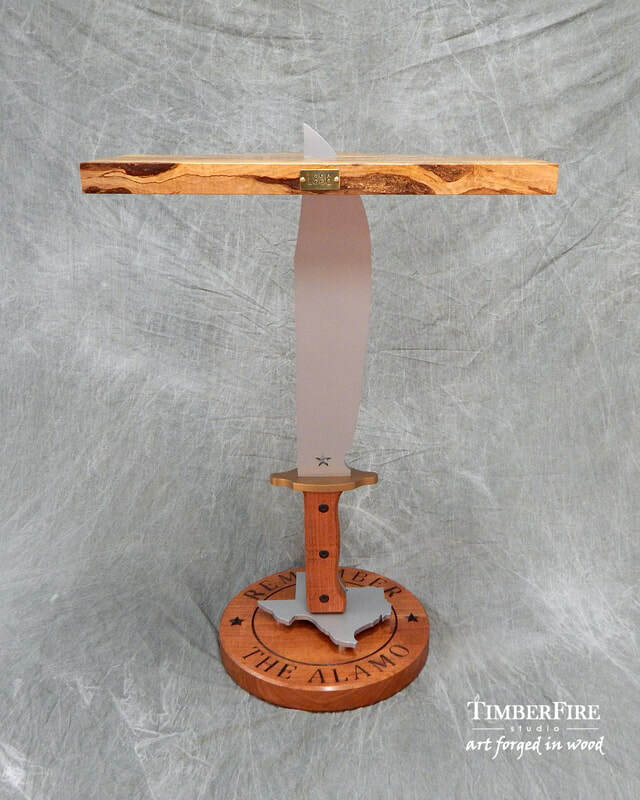 This Bowie knife is adorned with a Lone Star cutout and sports a Texas Mesquite handle. 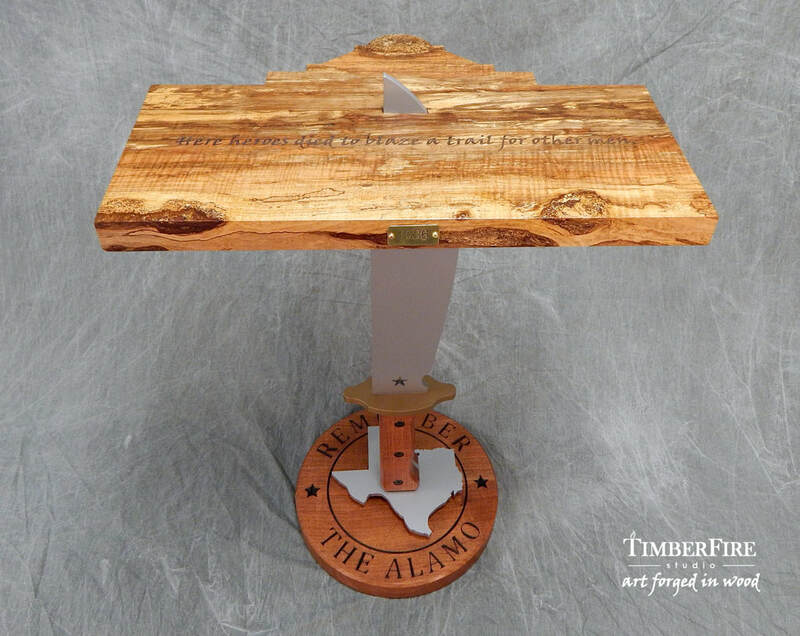 It stands proudly over the State of Texas. 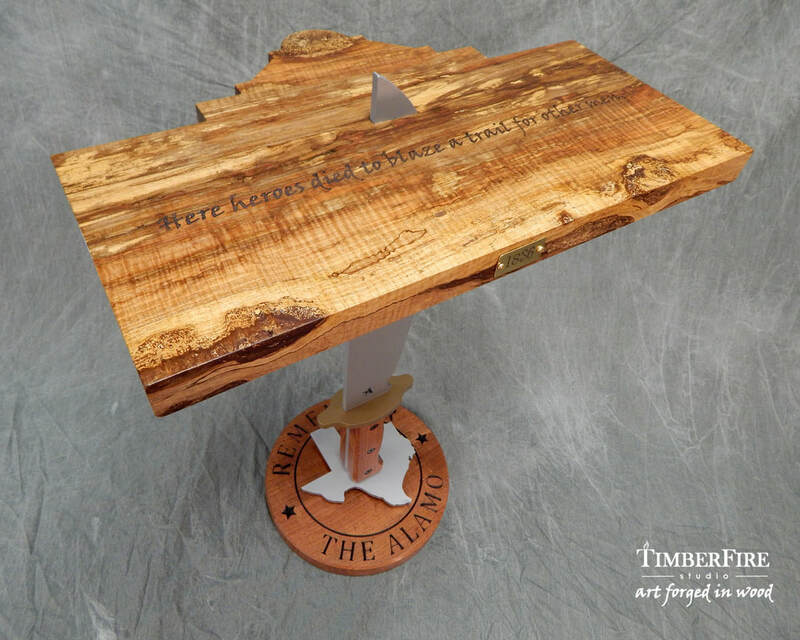 A small heart marks the town of Bowie in Montague County. The base is select-grade Texas Mesquite emblazoned with the battle cry that spurred the Texas Army to triumph over the forces of General Antonio López de Santa Anna. 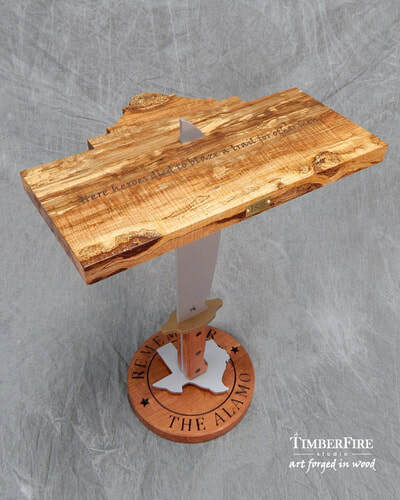 The wood finish is a European hardwax oil that has been hand rubbed to a satin sheen. The steel is coated with industrial enamel.